Wicket Good Time | All Around Dogs Wicket Good Time | Thoughts on training and life with dogs. I have been bitten by the Agility bug and boy does that sucker bite hard. It has always been my intent to train Delta in Agility, but up until now things hadn’t come together for us to make much progress. Now we’re in a great foundations class and will have a sequences/handling class to move to when we’re ready. And now we’re starting to move outside of the classroom. Not for competition, we’re nowhere near ready for that, but I’ve had a couple of opportunities to give us both some great exposure and practice. After our adventures at Tuft’s for the muscle mass study, Delta and I popped down to Springfield, Ma. to visit my friend Jill at the Thanksgiving Cluster. We got the very important practice walking around and playing at a show site, Delta practiced behaving herself in a crate, and I pitched in as ring crew. I also watched people’s different handling styles, which is fascinating. The best run I saw that morning, I nearly missed all together. The handler was running silently – or at least speaking so quietly I didn’t hear him – and his dog was quiet as well. Watching the last few jumps, it struck me as a beautiful way to run. In a sport where many people and their dogs are barking with excitement or frustration, a silent team is something noteworthy. And while I didn’t see enough of the run to know if they Q’d, those last few jumps showed a team in harmony. The handler moved his body and the dog knew where to be. Simpatico. This inspired me to take full advantage of being around so many vendors. I picked up a set of 6 “2×2” weave poles and a tippy board from Arf and Running. Delta got to browse vendors too and marauded around the Wizard of Paws booth’s FitPaws equipment. She hopped on the donut, balanced on the bone, and caught us unawares with a leap on to the peanut (eek!). The woman helping us kept saying “Wow, she’s fearless, isn’t she!” … Lady, you have no idea. We made one other very important stop – the wicket. There was a Volunteer Measuring Official available, so I was able to fill out some paperwork and get Delta’s very first official AKC measurement. She came out at exactly 22″ which qualifies her for the 20″ jump height. Unfortunately, that is the absolute maximum height for that class, so she’ll have to be measured again to confirm she’s 22″ (or less). She thinks it’s wicket weird. 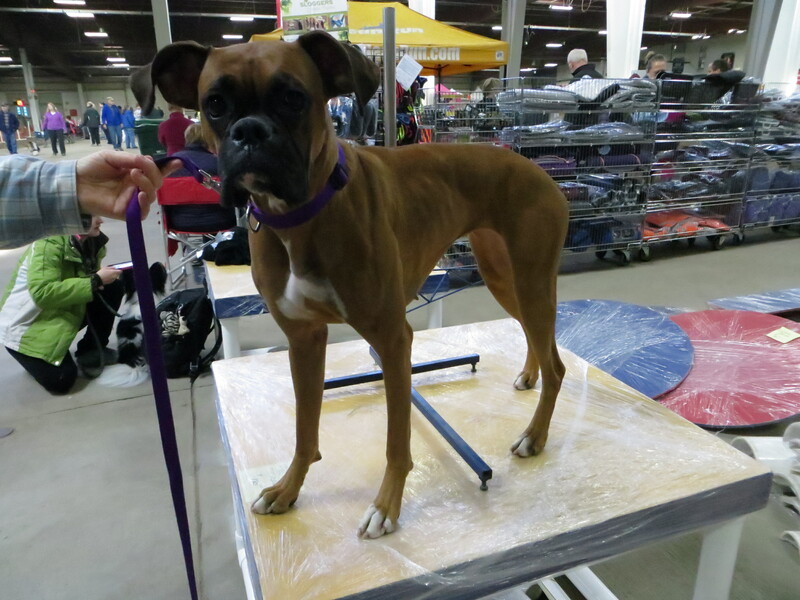 After that Saturday, I thought I was done hanging out at dog shows for a while when Jill sent me a flyer for an event for this Sunday – a “Not Ready for Prime Time” run through attached to a trial just 1 1/2 hours away. For a mere $5, you could bring your baby dog to run a Novice JWW course. Count me in! I even managed to drag Aaron along so I could practice having him in the audience. At class, most of our work is on skills stations or an occasion 2-3 obstacle sequence so we don’t really build up much speed. I knew that actually *running* Delta was going to be like driving a Ferrari with a learner’s permit. She didn’t disappoint. Similar to my “How to NQ” thought process, I planned to support my dog and to let Delta determine what we did in the ring. We don’t know how to do 6 weave poles yet, so we were definitely skipping that in favor of a tunnel. I wasn’t sure if we’d do the whole course at once, stop every few obstacles or even repeat one sequence a couple of times. But I had rough plans for each possibility so we could practice what worked for her and be successful. She decided we were going to do the whole darned thing, and would I please hurry up? I had to pull her back and reset twice because she got too far ahead of me, but we didn’t stop until she was over the last jump. I let out a whoop and we had a little party. We both wanted to do it again – though I would have to catch my breath. Stop making me pose, woman. I want to play with my toy now. 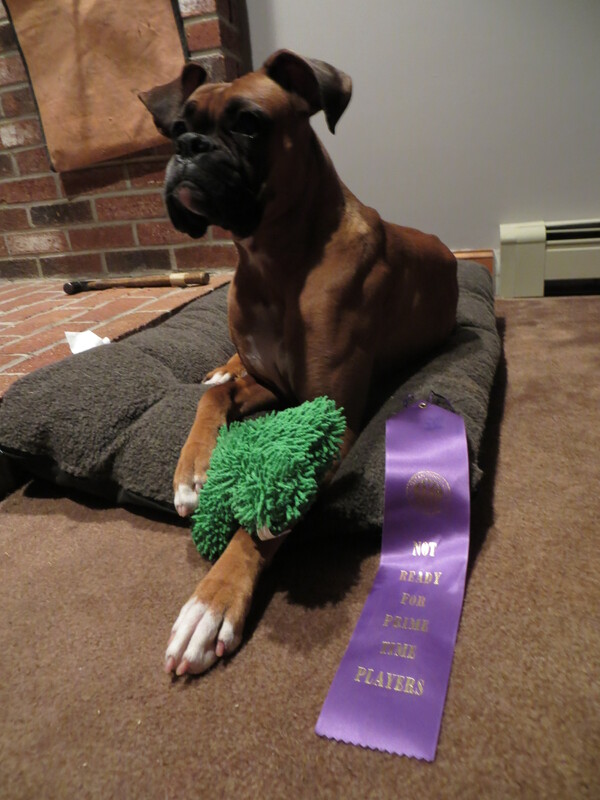 The host, Yankee Golden Retriever Club, was nice enough to give us ribbons and a toy to celebrate. Overall, a successful day and a helluva lot of fun. Rest up baby, soon we’ll be on to the next adventure!